The West Tamar Historical Society Inc. (WTHS) was formed in April 2000 after a visit to the York Town Historic Site organized by Richard Hooper. West Tamar Municipality on the west side of the Tamar River north of Launceston, Tasmania. Meetings: The Society meets at 7.30 pm on the third Tuesday of every second month alternating between Exeter and Beaconsfield. Membership: Membership costs $15 per year and new members are welcome. Historian: the Historian is a magazine containing history stories about people, places and events in the West Tamar area. It is published 2 or 3 times per year. Back issues can be purchased for $3.00 plus postage. Way Back When: the WTHS in conjunction with the Launceston Historical Society Inc. and the George Town and District Historical Society Inc. have been publishing history stories in the Examiner every Saturday since 2004. A book of these stories will be published in 2012. West Tamar History: Our members have written a number of stories about places in the West Tamar. Click on locations on the map to find out more about the history of each area. York Town is the fourth oldest permanent settlement in Australia behind Sydney, Norfolk Island and Hobart. It was settled in December 1804 under the leadership of Lt. Col. William Paterson. At its height it was home to 300 people. It had a year round water supply and was close to Bass Strait but it had poor soil and difficult access. Launceston was commenced in December 1805 and the two settlements co-existed until York Town was largely abandoned in December 1808. The society have researched the history of the site, have located nearly 50 building sites from the original settlement, have opened the site for visitors, have conducted an archeological excavation on the site and continue to promote the history of York Town. The site is on the Register of the National Estate and on the Tasmanian Heritage Register. The site is managed by a committee with representatives from WTHS, West Tamar Council, Parks & Wildlife Service and local landowners. York Town Museum Display, will provide an updated exhibit for the Gold & Heritage Grubb Shaft Museum in Beaconsfield which will include the model of the site as well as some of the artifacts from the archaeology of York Town. A brochure telling people about York Town will also be produced. Electronic Historical Promotion, this website was funded by the Beaconsfield Community Fund. Kerr-Stuart Locomotive, used to operate on the Wyett Tramway from Beaconsfield to Beauty Point. It was found at a sawmill site at Camden. Its retrieval, restoration and erection in the Grubb Shaft Gold & Heritage Museum is under way. 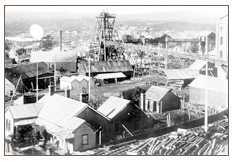 Ballarat Gold Mine, is only 300 metres from the Grubb Shaft Gold & Heritage Museum. A walk to the site and some interpretation signs for this 1880 gold mine remains will be constructed at the beginning of 2008.